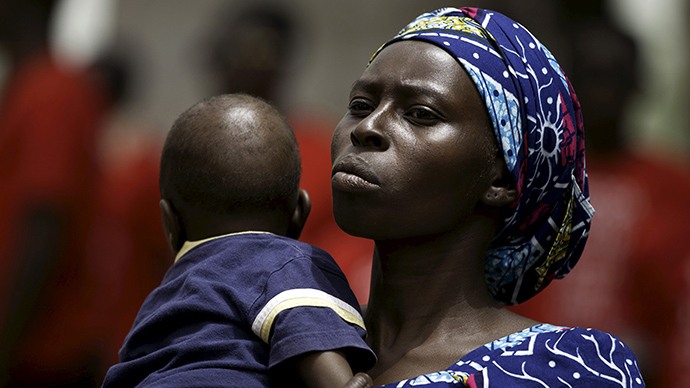 About 214 women rescued from Islamist Boko Haram militants in north-east Nigeria are pregnant, according to local media citing the Chief of the UN Population Fund (UNFPA). The Nigerian military said it freed nearly 700 women last week. “Already, many of them are undergoing screening for various diseases, infections including HIV/AIDS and about 214 of those already screened were discovered to be at various stages of pregnancies, some visibly pregnant and some just tested pregnant; but we are supporting all of them with various levels of care to stabilize them,” said UNFPA Nigeria executive director Babatunde Oshotimehin speaking in Lagos. “Some of the children that were freed along with the women, it was discovered, were born in the forest and had never been out in the open until their release by the Nigerian Army,” Osotimehin said. “What we found is that some of the women and girls that have come back actually have much more in terms of the stress they have faced, so the counselling has to be more intense and working with them one-on-one,” he added. In 2014 UNFPA aided over 16, 000 pregnant women who had given birth in camps for internal refugees, Osotimehin also noted. On Friday, the Nigerian army announced it had secured the release of another 234 women and children who had been held hostage in the Sambisa forest. According to AP, over 677 females were rescued last week from Boko Haram’s stronghold in country's northeast. Boko Haram is terrorist group, founded in 2002, whose name means ‘Western education is forbidden.’ It burst into the international spotlight in 2014 after abducting 200 schoolgirls from Chibok, a village in Borno state, with the intention of selling them at markets. The kidnapping sparked protests worldwide and inspired online campaigns supported by prominent politicians who denounced the militants’ actions. Militants have killed more than 13,000 people over the past six years in an effort to establish an Islamic caliphate in northeastern Nigeria. The group has been carrying out mass kidnappings, massacres and raids after gaining strength following an uprising in 2009. The Nigerian terrorist group has recently demonstrated more pronounced commitment to the Islamic State militants (IS, formerly ISIS/ISIL), changing its name to ISWAP or Islamic State’s West Africa Province in April.